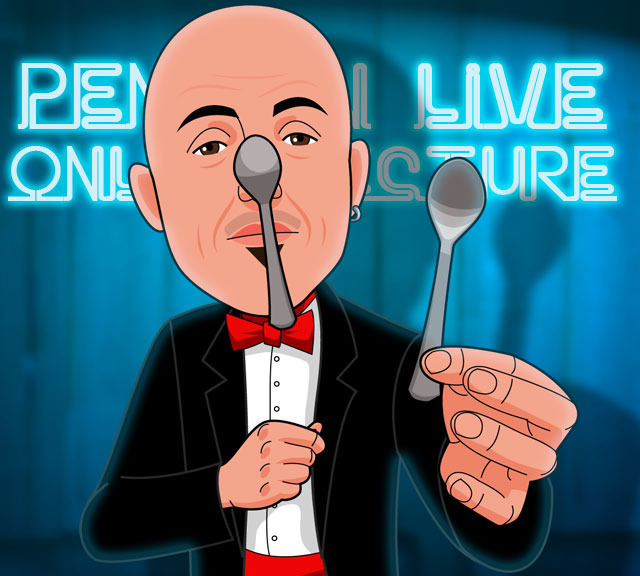 Today, when you order "Matthew Johnson LIVE", you'll instantly be emailed a Penguin Magic gift certificate. You can spend it on anything you like at Penguin, just like cash. Just complete your order as normal, and within seconds you'll get an email with your gift certificate. Matthew Johnson LIVE (Penguin LIVE) One of the funniest and most energetic magicians around came to Penguin for an insane 2 1/2 hour live lecture. SUPPORT LIVE MAGIC. DOWNLOAD THE FULL LECTURE TODAY. 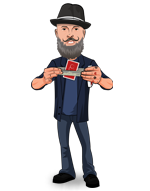 SPECIAL OFFER: Order Matthew Johnson LIVE TODAY and instantly download Matthew's definitive guide to booking magic shows over the phone called "The Rule of Thumb" which will teach you what to say and exactly how to say it. Start learning now (will appear as "Matthew Johnson LIVE" in your MyPenguinMagic access area)! Any Card at Any Number: Matthew’s new streamlined version with just 2 decks & instant reset. The Gum Thing: A piece of gum is popped out of a gum packet, chewed and then goes back in time to appear, sealed back in the gum packet. Black I: A card is chosen and signed and lost in the deck. A large black letter I is drawn on the back of the top card of the deck. The I vanishes, travels down into the deck and appears on the signed selection (instant reset). Sweet: Mentalism with four borrowed sugar packets (instant reset/no prep required). Knife A King: Hilarious find a card revelation. This one is X-Rated because of the language used. Really cool little bit for nightclub and bar audience but it does use strong language. Improved Vanishing Card Case: Great card case vanish. Gimmick does have to be constructed, but once made will last forever (instant reset). The Naked Mind Reading Magician: Mentalism card revelation. Funny & a little risque, but no suggestive language used. Matthew Johnson is a magician, juggler, physical comedian and our friendly neighborhood lunatic. He has toured the world performing his unique brand of zany, yet amazing, magic that delivers nonstop laughs and surprises. And now, he's coming here to Penguin Live to delight you with a mixture of comedy and hard-hitting magic and mentalism. If you like to laugh and be amazed, join us to see why Matthew Johnson has been requested to teach his unique style to professional magicians all over the world. From the Magic Circle in London, to the Magic Castle in Hollywood, and even to the World Championships of Magic, FISM, people are raving about Matthew Johnson. We think you will too. If you've never been to a magic lecture, theres never been a better time. Sunday September 8th at 7:00pm, were live-streaming Matthew Johnson in a spectacular 2-hour interactive online lecture. Watch, ask questions and learn things you won't find in any book or DVD. Purchase the Matthew Johnson LIVE product. This is your ticket. On Sunday September 8th, anytime before 7:00pm Eastern, click the MyPenguinMagic area at the top of the Penguin site. You'll see the livestream appear 1 hour before showtime. At 7pm sharp, Matthew will hit the stage and begin his JAM-PACKED professional lecture. Ask Matthew questions and discuss the tricks DURING the lecture. *Please note: We experienced a minor audio issue that affected the first 3 minutes of the lecture. Luckily this only affected part of the introduction. No performances or teachings were affected. He teaches a great bunch of tricks. All with advanced gimmicks or preparations. But he also teaches how they instantly reset so you can do them again and again for walk around, though many things you will need to BUY to do the trick. And also some of the tricks need big hands. I personally enjoyed this lecture. Mathew is a good teacher, but does kind on go on, so to speak. If you want a very fun and not to technical ACAAN routine, he teaches a very good method. It will take some practice in removing the deck from the case, but worth the effort for the effect. Most everything taught ends with you reset and ready to perform the effect again. This is great if you table hopping. A little heavy on card magic, but above average routines. If you are into smart phone magic, he explains a REALLY GOOD effect using your internet capable phone. No app to buy, but a very impressive routine you can do that is very easy to do and very fooling. Overall I gave this a 4 star rating because of some strong language and slight audience thumping. Nothing to bad, but I personally prefer my Magic to be Audience friendly without the adult theme. Good Magic, be sure to check out his effect "Melt" also sold on Penguin. Matthew provides his ideas for instant reset tricks to play everywhere! I've been a Matthew Johnson fan for a while now. I do his effect "Melt" all the time. Check it out here on Penguin as well. For me, this lecture is jamb packed with great material for the Walk around or table hopping Magician. His Any Card at Any Number is about as easy of method for this classic effect as you'll find. For me, this one effect is worth the cost of the entire lecture. You reset right in front of the spectator, but they don't have a clue you are re-setting as the patter makes perfect sense. It's perfect! This lecture is a nice mix, and most of the effects taught reset easily and naturally. I thought it was easy to follow and well taught, without a lot of goofing around. I liked this lecture and I'm sure you will too. Get this one! Mathew is a fun to watch and is an excellent instructor. This is a very good 'live' feed.